Superstar tenor Placido Domingo could have easily traded on his movie star aura to walk through the fundraiser concert for The Chamber Orchestra of Philadelphia in Verizon Hall Feb. 16. Instead, the mighty tenor delivered a musical event. Domingo commands the stage with authority and graciousness, bowing and flashing emperor salutes, kissing the hand of the concertmaster as expertly as Gilbert to Garbo. He could have wrapped his voice in cotton or gratuitously torn through tenor crowd pleasers, instead this was an interesting mix of scenes, arias and duets with co-star Ana Mar a Martìnez, a young soprano, who proved to have as much power and subtlety in her voice as Domingo. Conductor Eugene Kohn launched the orchestra with a bumpy opening of Berlioz’s Rakoozy March from ‘The Damnation of Faust’ but immediately settled for crisp orchestral accompaniment. Domingo and MartÏnez alternated solos starting with the tenor for Massenet ’O, Souverain’ from El Cid, and immediately consumed the hall with his voice, instantly apparent that he was going to give scene performances, not sterile recital readings. The first half highlight was ‘Lamento di Federico’ for Cilea’s L’arlesiana,’ the beautifully restrained entrance building to the steeled muscle of the finish. Domingo was much more tentative on ‘Winterst¸rme’ from Die Walkure, although all of the Wagnerian drama came over. MartÏnez built quiet power with Gounod’s ‘Jewel Song’ from Faust, a warm up for her vocal prowess she displayed in Puccini’s ‘Vissa d’arte’ from Tosca. The singers finished the first half with the ‘Cherry Duet’ in Mascagni’ ‘L’amico Fritz’ so tenderly that the vocal chemistry was almost secondary. The second part of the program was much more musically unfocused, with Domingo starting to vault his vocal power. A missed opportunity for Domingo came with Richard Rogers ’Some Enchanted Evening’ from ’South Pacific’ you would expect this sonorous melody would be perfect for Domingo’s voice but he really brought nothing to it. MartÏnez was equally uninventive with Loew’s ‘I could have danced all night’ from ‘My Fair Lady’ forgetting any arc of enchantment. In contrast, they were great with Leonard Bernstein’s songs from West Side Story. Domingo having no trouble convincing that he was Tony, completely enamored by ‘Maria’ and both infusing ‘Tonight’ with theatricality and intimacy. A fine musical evening for a benefit, capped off with COP’s raucous version of Bernstein’s overture to Candide. The woman in front of me was jumping out of her seat to the thrilling trills of the woodwinds. Actually, this audience was pretty unruly. They flashed cameras, talked at will and, in one case at least, boozed on site. 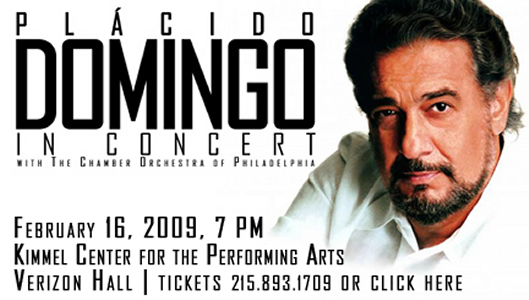 Well, Domingo hasn’t been in Philly for 25 years or so, people got giddy.